Mastercraft Vac-N-Sump is an automatic water recovery pump out vacuum that can dump solution as fast as it recovers it. The vacuum comes with a 15' recovery hose, and a 50' dump hose. With a pump out rate of 28 gallons per minute, this machine rates around the middle of the pack for performance, when compared withe the rest of our flood water extractors. As the 20 gallon tank starts to fill, as long as the bilge pump is turned on, it will automatically start dumping the recovered liquids. The vacuum motor pulls 7.5 amps when ran alone, and the pump pulls 8.0 amps when run alone. When run together, under a full load, the machine will pull a combined 15.5 amps. This machine is perfect for flood restoration and swimming pool maintenance. Quickly pump out above ground or in-ground pools in preparation for winter or maintenance. We also offer other machines for these same tasks, like our water vacuum with pump out system and our flooded basement water vacuum. 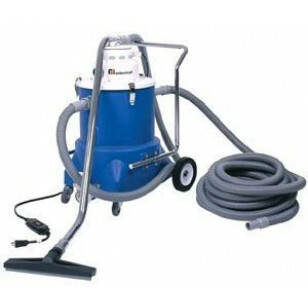 Tool kit comes with 15' intake hose, 50' discharge hose, mesh filter bag, 5' metal wand, 16" squeegee and 12" gulper tool. Bilge pump can be set to discharge through a ¾" garden hose or 1½" hose (50' x 1½" dump hose included). 1.3 horsepower vac motor recovers large volumes of water while the bilge pump automatically pumps out that recovered liquid. Three heavy duty spring steel clamps ensure a positive vacuum seal between the tank and the vacuum head. Comes with a 5 year warranty on the tanks, 2 years on motors and 1 year on parts. 5 year warranty on the tanks, 2 years on motors and 1 year on parts. This is a review for the Mastercraft Vac-N-Sump™ Automatic Water Recovery Pump Out Vacuum.